Moving or relocating overseas? 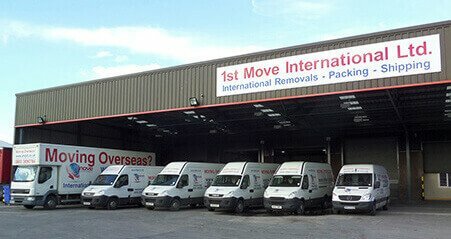 For help and advice, contact 1st Move International here. To find out more about International Relocation costs, simply fill out our quick quote form or send us a question in the box below. We'll get right back to you! You will receive a confirmation email in the next few minutes and a member of our team will get back to you as soon as possible. Ask us a question below or click for an International Moving Quote. National coverage available throughout the UK: We also operate receiving and collection services throughout the UK including facilities in London, Manchester, Leeds, Liverpool, Birmingham, Bristol, Newcastle, Edinburgh, Glasgow.